A: I am working on a large pastel-on-sandpaper painting that features two figures found in Mexico City in March – the fish-face mask and the lying dog – and an angel ceramic thing I found last year in Todos Santos, Mexico. 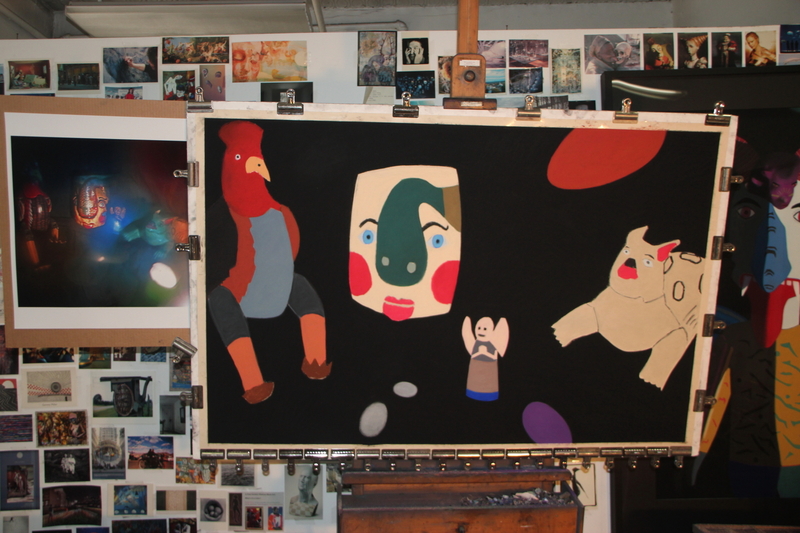 Posted on August 16, 2014, in Art Works in Progress, Black Paintings, Creative Process, Pastel Painting, Photography, Studio, Travel, Working methods and tagged angel, ceramic, dog, easel, figures, fish-face, lying, mask, Mexico, Mexico City, pastel-on-sandpaper painting, today, Todos Santos. Bookmark the permalink. 2 Comments.